Sarangapani is one among the numerous names of Lord Vishnu. This name is more popular in South India. There are Hindu temples in Tamilnadu dedicated to Sarangapani. Why Lord Vishnu is known as Sarangapani? 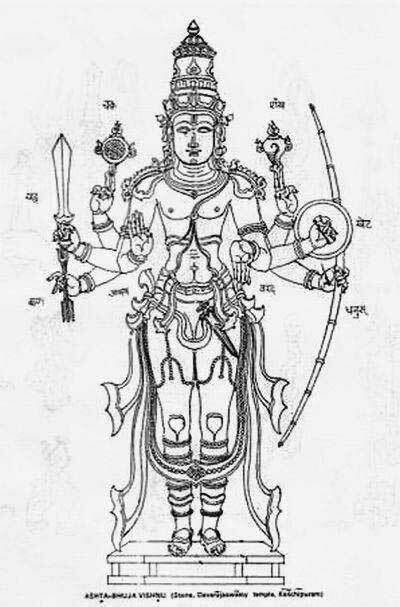 Vishnu is known as Sarangapani because he holds the bow Sarnga. The bow was created by Vishwakarma. Another version has it that he appeared along with a deer named Saranga. A popular temple dedicated to Sarangapani form of Vishnu is located at Kumbakonam in Tamil Nadu. Legend has it that Vishnu appeared as Sarangapani before Hema Rashi. The sage had performed intense austerities on the banks of a pond named Pottamarai. It is said that Vishnu appeared on a chariot drawn by elephants and horses. Regarding the information 'given in today's blog, 'Sarangapani', it is 'Sarangapani' and not 'Sarangapani'. 'Sarnga' is bow in Samskrta, whereas "Saranga' is deer. Sarangapani is Lord Vishnu, holding the bow and Sarangapani is Lord Siva, holding the deer.